Families understand Gloria and include her in their lives. She went to the big Patriots Super Bowl parade in downtown Boston! Gloria makes a difference outside of the walls of the classroom, too. 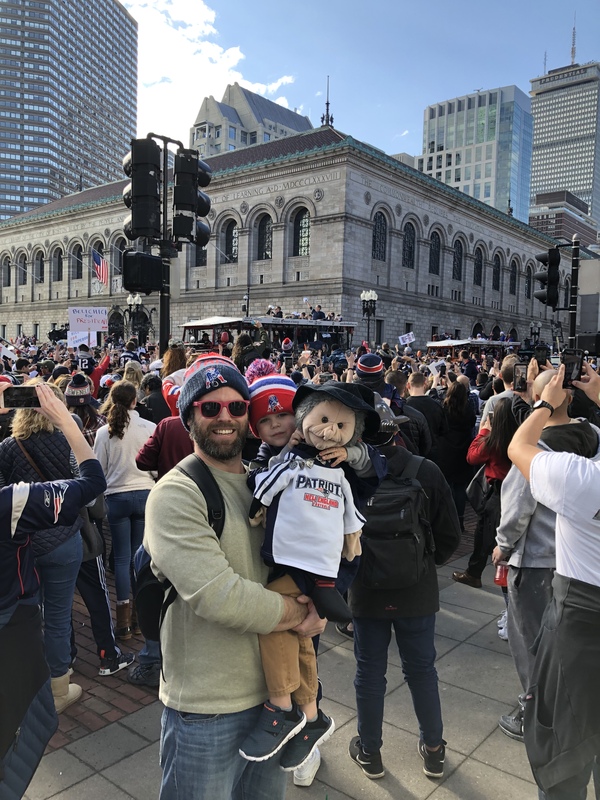 This entry was posted in behavior, Diversity, Early Education, Expressing words and feelings, Family, Gloria, Kindness, Love, young children and tagged Diversity, Gloria, New England Patriots, Super Bowl Parade, teaching young children. Bookmark the permalink. Apparently she did! I do feel a twinge of envy, but fighting the crowds would have been more than I could handle. Thanks, Dan. What a great fan she is! That’s a wonderful idea, Jennie. The parents need to be involved with this, and what a great way to do it. You are so wonderful! Thank you so much! Now that’s a good dad! Makes me smile. He is one great dad, and definitely ‘gets it’. Best to you, Pete. Jennie, I’m smiling at your post and photo! A great day had by all, full of joy, laughter. Wonderful how Gloria came along too! I bet there was a lot to discuss in the classroom the next day! I hope she enjoyed it! Gloria is so lucky! This made me smile, Jennie. How cute! I love that Gloria is incorporated into the lives of your students’ families! That is awesome! What a great dad! Gloria would love that! 😀 Actually, this is a great idea, Steve. Does your school have preschool and kindergarten, or just high school and older grades? Well, while this is Bill’s territory, we’re 60 miles from Buffalo, so my comment was a bit tongue-in-cheek. ‘My’ 2 schools are middle and high school. In the district, there is a third school for 3-5 and a third school for K-2. Next year, K will be full day, as other towns in the area have done. My town does not have pre-K.
That is wonderful, Steve! I often think if I had grown up with diversity, I would have been where I am right now at the age of 40. Make sense? Love your description of the Red Sox and the pretenders. Priceless! That’s the kid thing about Instagram. I can hang out and ‘chat’ with ‘kids’ like you and feel like one, myself. Here I am, a ‘retiree’, hanging with you ‘youngsters’ on IG and talking to even younger ‘youngsters’ every morning in wind, rain, snow, cold and lovin’ it. Have a great weekend ! When did you post it? I’m behind (as usual). I think she had a wonderful time. Thank you, Michael! It’s good to see Gloria enjoying her outings and adventures. There’s no stopping her. She’s afraid of nothing!